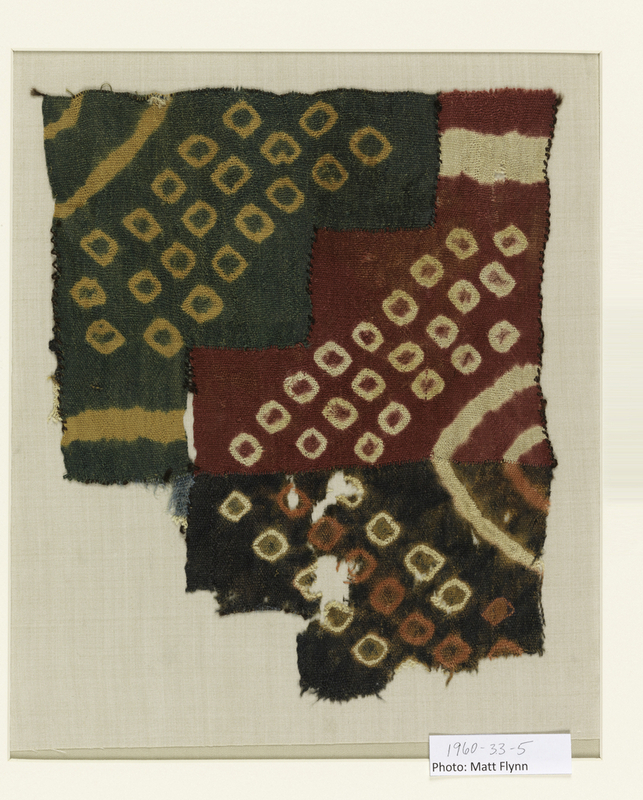 The wild and syncopated play of color and pattern in this tie-dyed textile from ancient Peru seems to counter the meticulous and steadied hand of the Andean weaver. The fabric was in fact specially woven in discreet, stepped-shaped units that were cut apart and re-assembled after being tie-dyed, mixing up the variously dyed sections. Several examples of complete garments made in this technique, specifically male tunics, have been preserved. They are associated with the Wari culture (ca. 600– 800 AD) and were found in various sites including the Nasca region along the desert coast of Southern Peru. The wearers of these garments must have represented a special sub-group of Wari society—perhaps one whose vision had been impacted by religious rituals involving psychotropic plants. This would explain the sense of visual chaos and play in the patterning, which differs greatly from the high status garments woven in fine tapestry weave that were used by the elite.